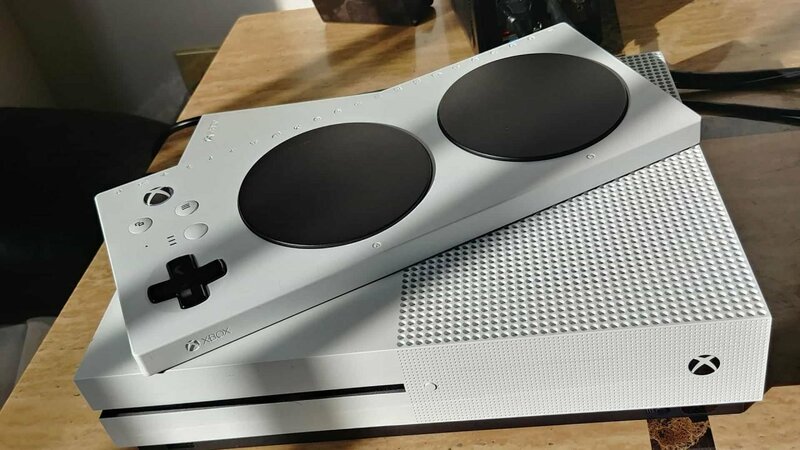 As a person’s living with a permanent physical disability, Microsoft’s adaptive controller for the Xbox One and PC was something that piqued my interest, despite being fully comfortable with a traditional controller/ keyboard and mouse. 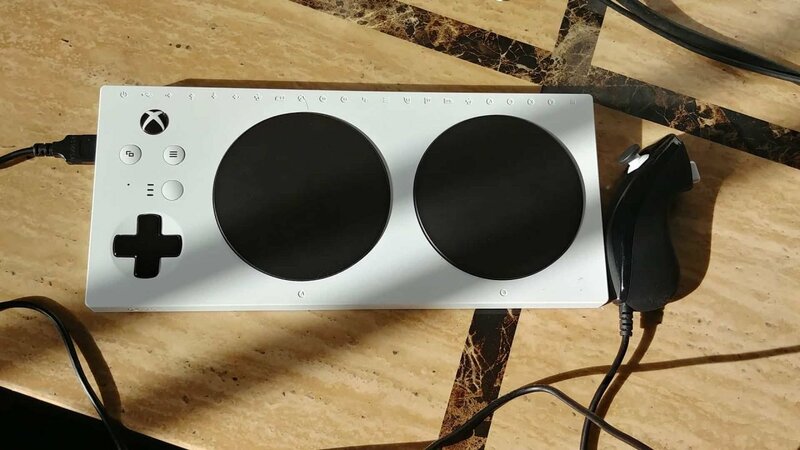 I was wary that the adaptive controller would somehow be compromised in its execution, something that does its job, but ultimately doesn’t encompass all the nuances of using a traditional gamepad — I’m happy to say that Microsoft has done an incredible job in constructing a thoughtful and powerful bridge between content and accessibility with the adaptive controller, which is much less a controller, and more of a hub. Even before diving into the device itself, I noticed that the package design for the adaptive controller was crafted with ease of access in mind. Two ribbon-like pull tabs with circular grips made it very easy to pull, and open and expose a more standard looking pull tab that eased the box open, revealing the adaptive controller itself. Behind the adaptive controller and a simple illustrative quick-setup guide pamphlet, a single USB Type-C cable was included, which is required to charge the controller, once connected to the Xbox, PC or outlet. 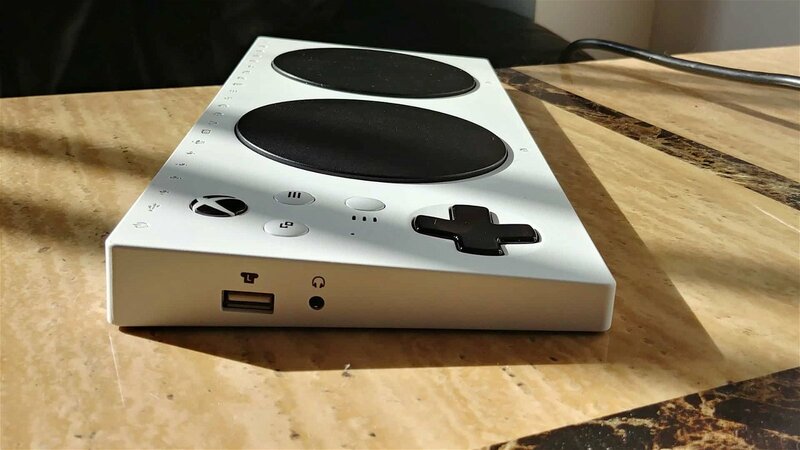 Aesthetically, the Xbox adaptive controller, at first glance, looks a little like a tiny turntable, a rectangular and angled slab with a d-pad, sync, share menu button, two USBs, and finally, two large and distinctive black buttons. The back of the adapter houses a row of 3.5mm jacks, each representing a different button or facet, found on a standard Xbox One controller, while the USBs on each side of the device act as IO for the left and right stick, respectively. The d-pad, sync and menu buttons feel just as good and of the same quality as their standard controller counterpart, just bigger and easier to quickly press. The two round black turntable-like buttons have a very satisfying mechanical feel, akin to a good fighting stick or keyboard, with a nice grippy matte finish, making it easy to distinguish just by touch. I’ve used the word ease or easy several times already, this is simply due to how thoughtfully Microsoft has designed the Adaptive Controller with the concept in mind, which after all, is the point of the device in the first place. 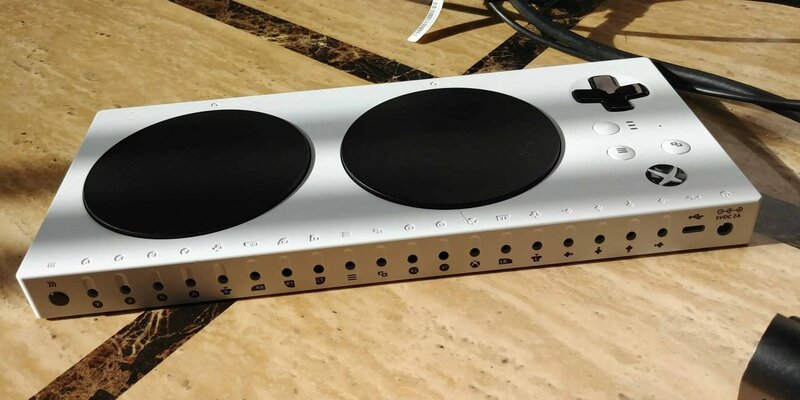 Earlier, I mentioned that the Xbox adaptive controller can be defined as more of a bridge or hub — this is due to how the adaptive controller actually allows users to plug in peripherals. As mentioned before, the adaptive controller features the sync button, share and menu button, with the two round buttons representing the A and B buttons, and two USB inputs for analogue movement. The USB and 3.5mm inputs, instead of being auxiliary ports, are instead solely represented via external input, in other words, users with some form of disability that is normally impeded or unable to use a standard controller can suddenly now use whatever they are comfortable with, instead of having to deal with the stock controller, potentially compromising their enjoyment and engagement with whatever content they are playing. Of course, specialized controllers can span a wide gamut of configurations, conforming to the special needs of the individual, which is exactly why the nineteen individual ports on the back using the 3.55mm is a total win for the end user — specific and custom tailored buttons can easily be hot-swapped on the fly, instantly and drastically changing the input method of the controller, without ever needing to manually go in and mess around in either in-game settings or the settings found on the Xbox One itself. The use of 3.55mm jacks as the standard means of changing inputs also make it harder for users to exploit or use the adaptive controller as a means to cheat, as the device will only accept specialized peripherals, reserving it only to those who actually need it and can benefit from it. Included in the review unit, Microsoft also provided a PDP branded controller, reminiscent of the Nintendo Wii nunchuck, in addition to a foot pedal, with the former connecting up to either USB ports available on the adaptive controller and the latter, using the 3.55 standard, giving the user the freedom to bind any button they wish to the foot pedal. The nunchuck-esque controller highlights the potential of having one handed analogue input, mappable to both the left or right stick, respectively. On the same regard, the foot pedal controller highlights the potential of having a non-standard or unique alternative control input that can be mapped to any of the buttons available on a standard gamepad. Although I couldn’t play too many games as efficiently as I’d like, due to only having one analogue stick and a foot pedal that I mapped accordingly, based on the game, the titles I did play, all felt great and responsive, without any lag or delay between swapping or changing the inputs on the back (for the foot pedal). Users who want to further customize their input method can rest assured in knowing that the Xbox One instantly recognizes the adaptive controller while providing an in-depth settings menu, giving users the opportunity to change and map each facet of the device while also providing several profiles, ensuring the end-user the ability to quickly swap between profiles as they see fit. One stand-out title in particular that I found quite fun, thanks to the foot pedal was Forza Motorsport 7. Racing games are generally not my cup of tea (due to being really bad at them), however, mapping the Gas or right trigger to the physical foot pedal, made the game feel much more immersive than ever possible with just a standard controller (I still did awful but at least I had fun). Fun aside, the point of the adaptive controller is to deliver a more comfortable and accessible experience to those who dislike or can’t use a standard controller, in this regard, the adaptive controller truly excels, in that it provides users with a means of hot swapping anything they wish to the device, without worrying about compatibility issues or muddling about in setting menus. In the past, inclusivity in games have been limited to some, especially modern console games that generally don’t allow the use of third-party adapters, something that has unfortunately made it hard or in some instances, impossible for those with a disability or impairment to partake in. Microsoft’s adaptive controller has now potentially opened the door to this dilemma, giving players the flexibility of the PC, minus the need for specialized drivers or additional software. 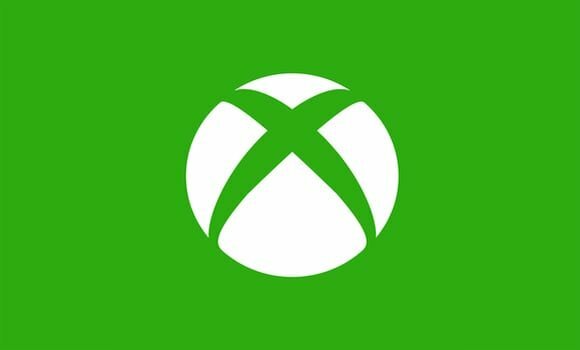 The Xbox Adaptive control is Microsoft’s answer to an uncompromised experience to those who require it the most. The Xbox adaptive controller is not an accessory, nor is it a controller, rather, it is an essential part of console gaming for those who need it.